The test results are in: Knee-jerk opponents of Common Core are NOT smarter than a fifth grader. The latest bogus example to gin up fake outrage comes from an anti-CCSS website called whatiscommoncore. 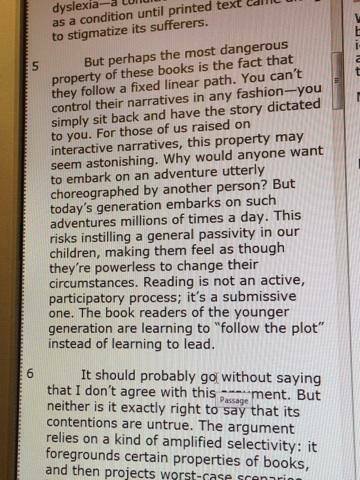 A Utah high school student captured screenshots of the SAGE test, showing somewhat philosophical resource material for the essay question, which was about the nature and value of books. Follow the link to view the screenshots. The question presents some reading material on the value of books, making a sort of modest proposal that books are static narratives that do not engage the reader, compared with narratives like video games that involve the reader. The essay questions then invite the student to write on that prompt, either supporting or refuting the argument. This is in the best pedagogical tradition of rhetoric, by making the student support or refute an argument on a provocative topic. The author says right in the text “It should probably go without saying that I don’t agree with this argument.” That’s in the screenshot. A Utah High School student took the Common Core (SAGE) test this week. Seeing objectionable issues in that test, she thought her mother should know. The student took screen shots using her cell phone and sent them to her mother. Her mother passed them along to us. 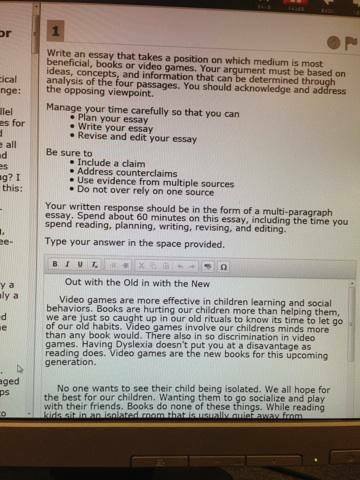 The message given in this test is that book literacy is inferior to the playing of video games. The test claims that literature forces passivity but video games teach students how to be leaders. Long live grunts and smoke signals. The test makes these following devilish assertions: “books understimulate the senses” and “books are downright discriminatory” and books are “choreographed by another person [while video games are not]“. These are mean pushes toward valuing video gaming instead of books and they precisely match the pushy philosophy of Common Core creator-turned College Board President David Coleman. They also match the philosophy of Microsoft Owner/ Common Core funder Bill Gates. So it is no surprise. It’s still sickening. It is the same idiocy that claims “Huckleberry Finn” is racist – or that “Brave New World” advocates sexual libertinism. The worst part is, it just might work. The questions probably lead to a disparate effect on groups who are protected by two federal statutes, Title VI of the Civil Rights Act of 1964 and Section 504 of the Rehabilitation Act of 1973. Since there is no need to ask those questions during the admissions process, it is likely that asking them violates both statutes. Tuesday April 1 5:00 pm. New charter application hearings for Mapleton Charter School at Whitehall, Delaware STEM High School, and Freire Charter School. Tuesday April 1 5:00 pm. Charter modification application for Odyssey Charter School. Wednesday April 2 6:00 pm. New charter application hearings for Great Oaks Charter School and Pike Creek Charter Middle School. Wednesday April 2 6:00 pm. Charter modification application for the New Maurice Moyer Academy Charter School. A page one article in the March 25 Cape Gazette cites the concerns of school officials and citizens in Sussex County that there is need for more diversity in charter and vo-tech schools, as well as more equitable allocation of resources. The League of Women Voters of Sussex County and of Delaware strongly share this concern, particularly since state- level education officials have long been aware of the diversity issues raised in this article. While moderate success is obvious in the charter schools, a number of negative or unanticipated outcomes need to be watched and considered carefully. These include accelerating the resegregation of public schools by race, class and ability, and the disproportionate diversion of district and state resources (both financial and human resources) from districts to the more recently established charter schools. A bedrock principle underlying our public education system is that every child is provided with an equal opportunity to fulfill their potential and become a productive citizen in our community. It appears that this principle has been seriously compromised for at least seven years by those responsible at the highest level in our state’s educational hierarchy. Action by the governor seems called for, now. A remarkable document landed in my inbox recently. It is a 103-page transcript of the 1995 Delaware Senate debate on SB 200 – Delaware’s charter school law. It is sort of like finding the Dead Sea Scrolls under a rock in your back yard, or finding the bill for the Last Supper stuck in an old pot. The filename says it is “Vol. 2,” and I suspect there is a Vol.1 still to be found. If anyone has it, please send it to me at mike01@seventhtype.com (hey, it can’t hurt to ask). There don’t seem to be any surprising revelations, though Kilroy hasn’t yet gone over it with his new bionic eye. The first 48 pages of the transcript are debating amendments to the bill. The rest of the transcript is fairly mundane, except for some fairly tense questioning of Bill Manning (then President of the Red Clay board) by Senator Marshall. SENATOR MARSHALL: Understanding that the harshest critics of charter schools around the nation where they’ve been in place and operating, is the issue of the schools skimming off the top and creating an elitist academy with public money. My concern is looking at the focus of the charter schools by attracting the best at times for a specific educational discipline offered by that charter school; and the concern of recruitment. I looked at children throughout New Castle County in moderate low income neighborhoods, I looked at the City, the west side, the east side, hilltop, I need to understand how your board and how you will guarantee fairness and equal access to every student from every unit. MR. MANNING: Thank you Senator. Let me approach that question two different ways because I hear the creaming argument over and over again with respect to schools of choice. One thing that particularly bothers me about that argument is that whoever is making the argument, whether you’re a member of the State PTA or whether you’re a Superintendent from a school district 100 miles away from a district that wants to try a charter, that person is basically saying I know better than the parents of that child where that child ought to attend. But that’s an argument that I’ve never really understood, and it’s always been a little offensive to me. You also hear the suggestion that for some reason children whose parents are college educated and have jobs that pay more will somehow get the better end of the deal. Which suggests that children of parents who for some reason don’t have a college education somehow aren’t able to cope in this system and aren’t able to make good choices for their children. I don’t believe that. And in Red Clay the experience is just the opposite. There’s more in that vein; go read the whole thing. Another thing that may be of interest: the roll call vote. I was surprised by how close it was 11-8, with 2 not voting. MADAM PRESIDENT: Mr. Secretary would you please call the roll on Senate Substitute No. 1 for Senate Bill No. 200 as amended. MR. SECRETARY: Not voting. Senator Amick? MR. SECRETARY: No. Senator Bair? MR. SECRETARY: Yes. Senator Blevins? MR. SECRETARY: Yes. Senator Bonini? MR. SECRETARY: Yes. Senator Connor? MR. SECRETARY: No. Senator Cook? MR. SECRETARY: No. Senator Cordrey? Absent. Senator Haig? MR. SECRETARY: Yes. Senator Henry? MR. SECRETARY: Not voting. Senator Marshall? MR. SECRETARY: Yes. Senator McBride? Absent. Senator McDowell? MR. SECRETARY: Not voting. Senator Reed? MR. SECRETARY: Yes. Senator Sharp? MR. SECRETARY: No. Senator Sokola? MR. SECRETARY: Yes. Senator Sorenson? MR. SECRETARY: Yes. Senator Still? MR. SECRETARY: Not voting. Senator Vaughn? MR. SECRETARY: No. Senator Venables? MR. SECRETARY: No. Senator Voshell? MR. SECRETARY: Senator Cordrey from absent to voting no. MR. SECRETARY: Senator McBride from absent to voting yes. SENATOR STILL: Not voting to yes. MR. SECRETARY: Senator Still from not voting to voting yes. SENATOR HENRY: From not voting to voting yes. MR. SECRETARY: Senator Henry from not voting to voting yes. Madam President the roll call on Senate Substitute No. 1 for Senate Bill No. 200 is amended by Senate Amendments No. 5, 1 and 6; eleven yes, eight no and two not voting. MADAM PRESIDENT: Senate Substitute No. 1 for Senate Bill No. 200 having received the required number of votes is declared passed the Senate. In order to bring socioeconomic, racial and special needs equality, fairness and balance to our public schools, we resolve to support policy, regulation and legislation that would require choice or receiving schools to mirror the demographics of the sending school district […] Once adopted, this regulation, legislation or policy, would apply to every public school in the state of Delaware including vocational, technical and charter schools. The resolution was authored by Seaford board member Frank Parks, and has already been adopted by the boards of Seaford, Cape Henlopen, and Christina. According to the resolution, the Delaware School Board Association has made it a legislative priority. While Sussex County student population is about 24 percent African-American, only 2 percent of Sussex Academy students are African-American. Sussex Tech is somewhat closer to the county profile, but still, only 17 percent of students are black. The gap is even greater for low-income students – 62 percent of the county students are considered low-income while Sussex Tech has a low-income students population of 33 percent and Sussex Academy has 18 percent. More food for thought for the Enrollment Preferences Task Force as it begins to form its recommendations. I know this resolution was on Brandywine’s agenda last night… How’d it do? I can’t imagine this being adopted by Red Clay. The fourth meeting of the Enrollment Preferences Task Force is at 6:30 tonight at Buena Vista. Here is the legislative web site for the task force including all minutes, agendas, and other documents. I have been delinquent in blogging lately, especially on this Task Force – life gets in the way sometimes. I am not a member of the Task Force but I have attended the first three meetings, and I am going to this one tonight. But first, I owe you a recounting of the previous meeting (Meeting #3). In reviewing the list of questions presented, I did not find any current legal requirements that would prohibit the list of questions, tests, or auditions presented. If pursued through successful legislation, those recommendations would then become legally binding restrictions. Most of Meeting #3 was structured in workshop format, with small groups working on ways to separate application info from enrollment info, as suggested by the DOJ. It looks like that is where the group is headed, and tonight it will begin discussions on forming recommendations. This is a time for public education advocates to stay on their toes and watch for untoward legislation being advanced from sources outside the task force. I remember all too well how HB 165 seemed to come out of the blue after the conclusion of the illegally secretive Governor’s Working Group on Charters. Fortunately, the Enrollment Preferences Task Force is transparent and wide open to the public, thanks to HB 90 sponsor Kim Williams. So get down to Buena Vista tonight and take advantage of the open access.